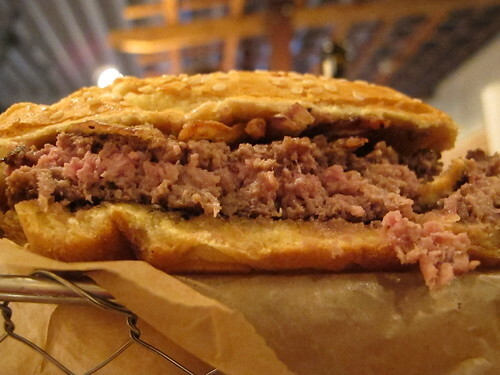 Since its opening last spring, I’ve heard nothing but glowing reports about Farm Burger in Decatur. Working on the premise that a better cow makes a better burger, Farm Burger serves only grass-fed beef that has been dry aged for two weeks. Taking it a step further, the Farm Burger cows are raised in the Southeast and sourced from local farms. What else could you really ask for? People will talk endlessly about the virtues of grass-fed over corn-fed and how locally sourced is superior to produce from half a world away, but it’s rare to see those ideals applied to a burger joint. Of course, every good intention is a waste without proper execution, but every blogger has written about perfectly cooked burgers that shone with a beefy brilliance. Needless to say, I had high expectations the night we made the drive to Decatur. I’ll have to give Farm Burger credit for their menu. In most burger centric restaurants, you’ll see a few options for building your own burger, but I’ve rarely seen the option to add oxtail marmalade or pork belly to my burger. With six standard combinations and more than 30 topping choices, it was incredibly easy to get lost in the Farm Burger menu. After designing our burgers and choosing our poison, it was easy to find a spot at one of the large picnic tables. From there, it was just a matter of seeing what emerged from the kitchen first. This time, Aaron’s appetizer was the winner out of the gate. 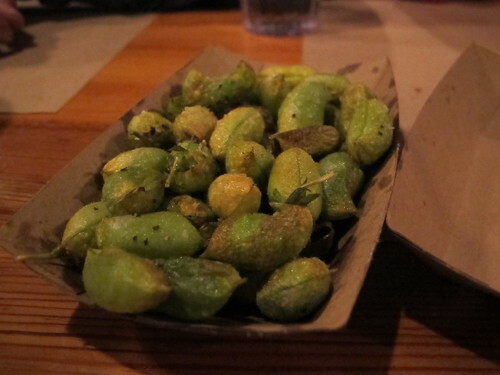 Fried Chickpeas are the first option from the Snacks section of the menu and they were not what I was expecting. When I read fried chickpeas, I immediately thought falafel, but this was the first time I’ve been served fresh chickpeas still in the shell. Salty at first, finding a chickpea was more of a challenge than I imagined. 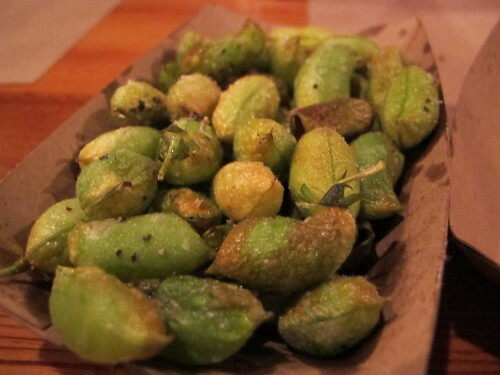 It wasn’t until the fourth shell that I actually found a chickpea, but the taste was worth the effort. 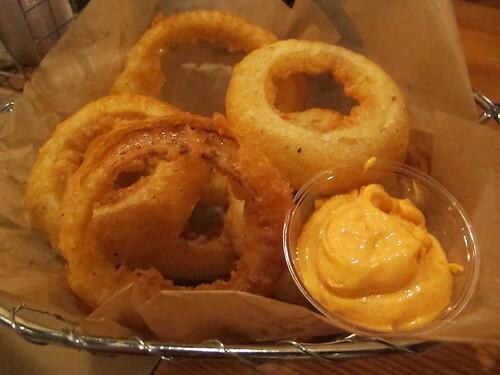 In addition to the fried chickpeas, Aaron had also ordered the beer battered onion rings with smoked paprika mayo. Fresh from the fryer, this onion rings were beautifully fried and very well salted. I wasn’t particularly swooned by the mayo, but the onion rings were just fine on their own. 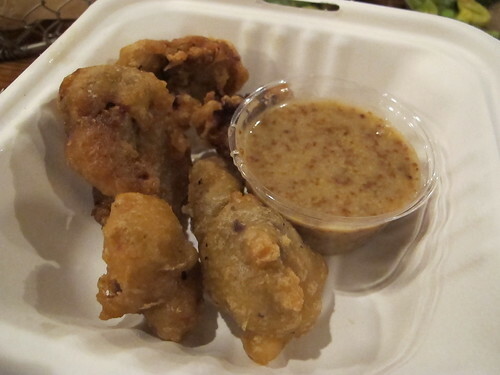 Even though we had come to Farm Burger for the burgers, I found it hard to pass up an order of the fried chicken livers. Despite being very well fried, these livers were chalky and incredibly overcooked. While I was hoping the dipping sauce would mask the flavor of overdone liver, it only amplified the chalkiness. Maybe I should have just skipped the livers and waited on the burger. Before we had time to mull over some of our surprisingly disappointing appetizers, our burgers arrived. 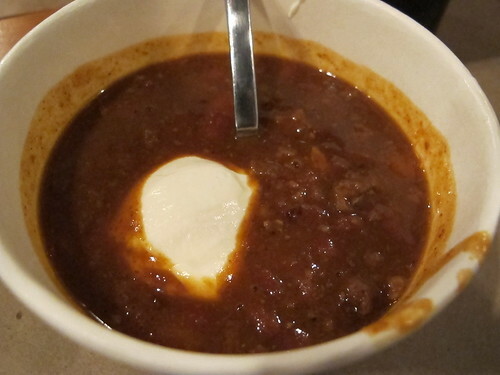 In addition to the burgers, my bowl of chili arrived. I love the idea of a brisket chili, but this one just wasn’t up my alley. While quite meaty and with a nice amount of cumin-laced spiciness, I just can’t enjoy a bean laden bowl of chili. The excessive amount of beans combined with a soupy consistency made me leave this bowl of chili largely uneaten. In order to get a taste of the variety that Farm Burger had to offer, I ordered two burgers. 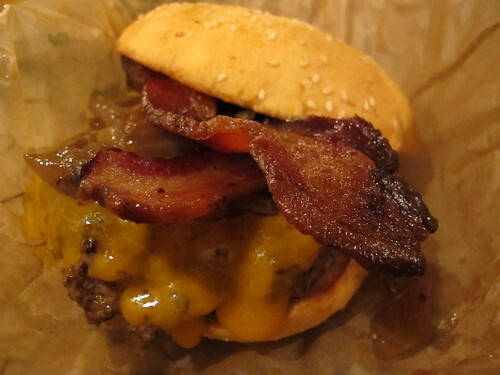 The first was a somewhat traditional combination of medium rare beef, cheddar cheese, and caramelized onions. 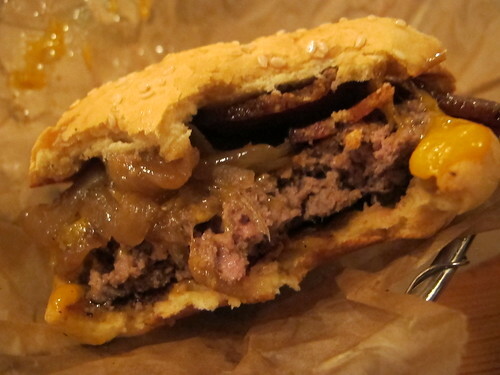 While the initial bite revealed a pleasant sesame seed bun, very tasty caramelized onions and a salty, flavorful exterior, things soon gave way to an extremely underwhelming burger. Instead of a deliciously moist medium rare, this burger had been cooked well past it. On its own, there wasn’t a particularly pungent, grass fed flavor to the patty, certainly nothing like the grass fed beef I’ve had before; combined with the other burger components, any beefiness was lost in a sea of cheese and bacon. Hoping to take advantage of some of their more unique menu offerings, I originally intended to order a burger with oxtail marmalade. For some reason unbeknownst to me, when I actually placed the order I said roasted bone marrow, not oxtail marmalade. 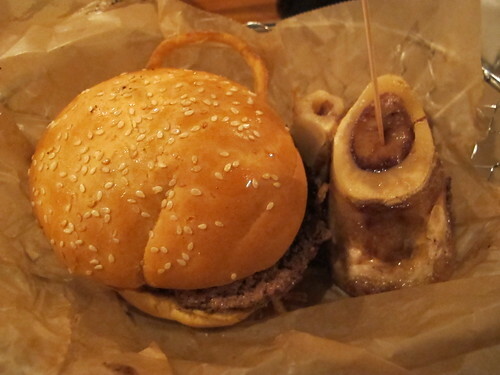 I was really hoping the bone marrow would come slathered on the burger like jelly. Crispy red onions are quite a change from the caramelized onions on the other burger. Unfortunately, this burger was just as overcooked as the first. With such overcooked beef, crispy onions, and silky bone marrow, it really was an odd combination of textures and flavors. 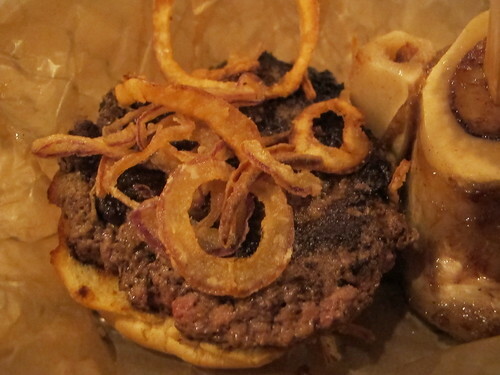 Actually with the crispiness of the onions, the whole burger came across as a beef cracker that only served to deliver the fatty marrow. As we left, this was one of the few times that Aaron and Jennifer have ever felt the need to apologize for a restaurant. During their previous visits, the burgers had been well cooked and delicious. Like me, they had received terribly cooked burgers and were completely underwhelmed. I tried to think of a reason why things had gone so wrong, but I was coming up empty handed. I hadn’t ordered particularly difficult burger combinations and there wasn’t a huge crowd so there didn’t seem to be any real rush for the kitchen. I quickly ran out of excuses. I’m really hoping that I hit Farm Burger on a bad night. With so many positive reviews and a mission statement I can believe in, I’d hate for this to be just another bad burger.